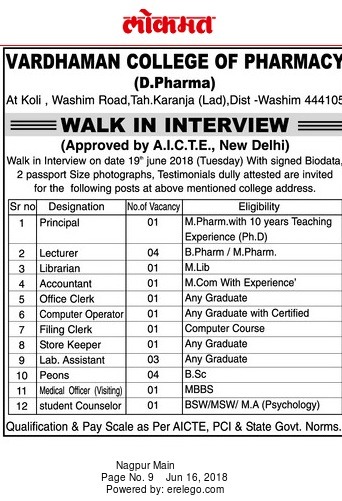 Vardhaman College of Pharmacy, Washim has advertised in LOKMAT Newspaper for the recruitment of Lecturers/Principal job vacancies. Interested and eligible job aspirants are requested to appear walk in on 19th June 2018. Check out further more details below. About College: Mission: To undertake the highest quality of technical education & research, forge industrial partnerships & deliver community service in order to meet the engineering manpower needs of the nation.